I often hear people say something like, “I saw a dog that looked like a Great Pyrenees the other day, but it wasn’t pure white. It must have been a mix.” They are then surprised when I tell them that all Great Pyrenees aren’t pure white! Some pyrs have colorations called “badger marks”. Badger marks come in several variations of badger, gray, or shades of tan. They are most commonly seen on the head and base of the tail. Per the breed standard, badger marks may cover no more than 1/3 of the dog’s body. 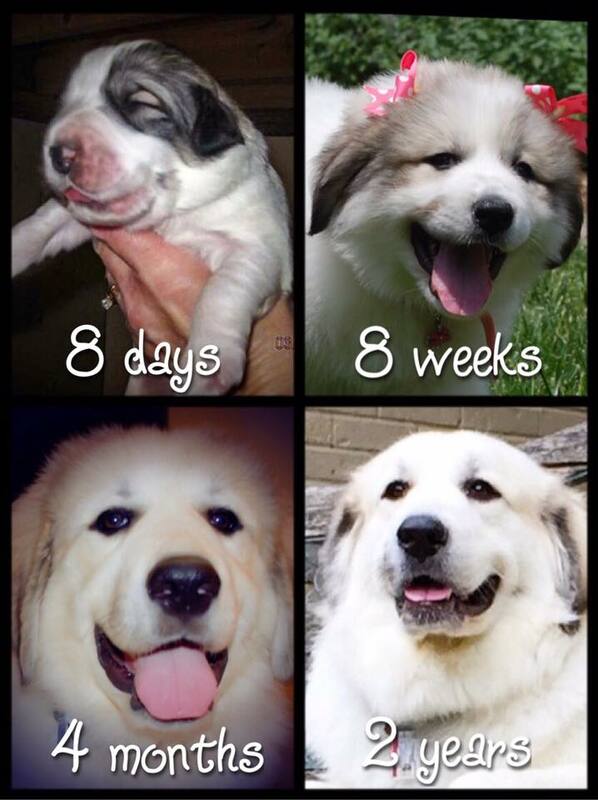 That means a pyr can have a significant amount of coloration! The most interesting thing about badger marks is that they change throughout the dog’s life. Dark badger marks on a puppy will gradually lighten over time; tan marks typically fade to white. What some people don’t realize is that badger marks can lighten and darken. Mauja had light tan badger marks that seemingly disappeared only to reappear just recently. Why do their badger marks change? Honestly, I’m not sure. It’s been hypothesized that the dark marks helped to disguise them among the rocks when they were born in the mountains long ago. The puppies were then less susceptible to predators. However, that’s only a guess! Since Mauja’s badger marks are extremely faint and Atka doesn’t have any at all, I polled the pyr community to get some pictures. I received so many amazing pictures and it was hard narrowing them down, but here are some great examples of the changes (or lack of changes) in badger marks. Carol Masters Beckman’s Roxy. 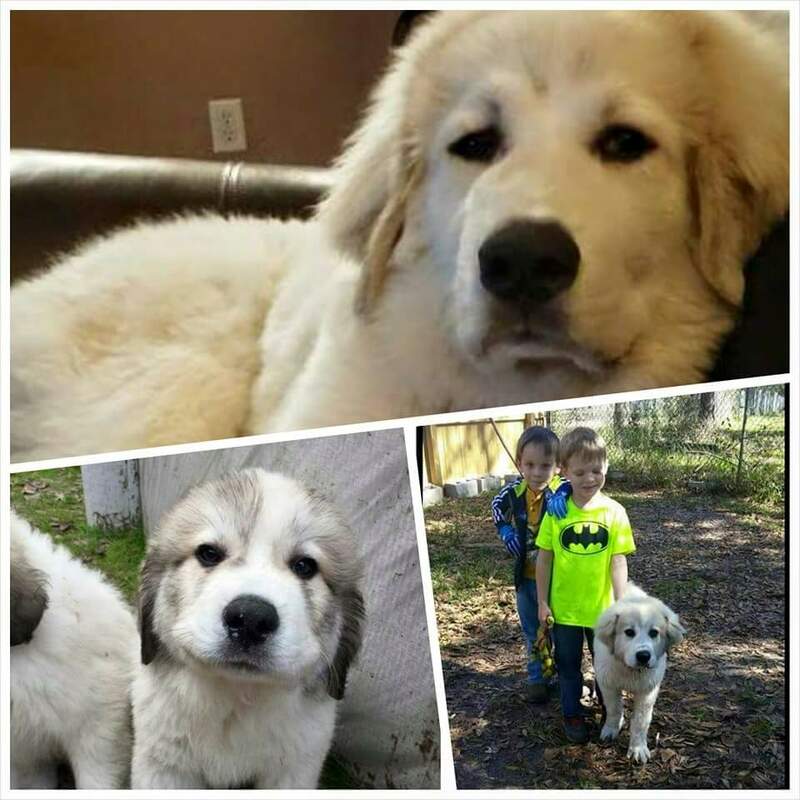 Check them out on Facebook at Beckman’s Great Pyrenees of Vaughn Hill! Carol Masters Beckman’s Bella. 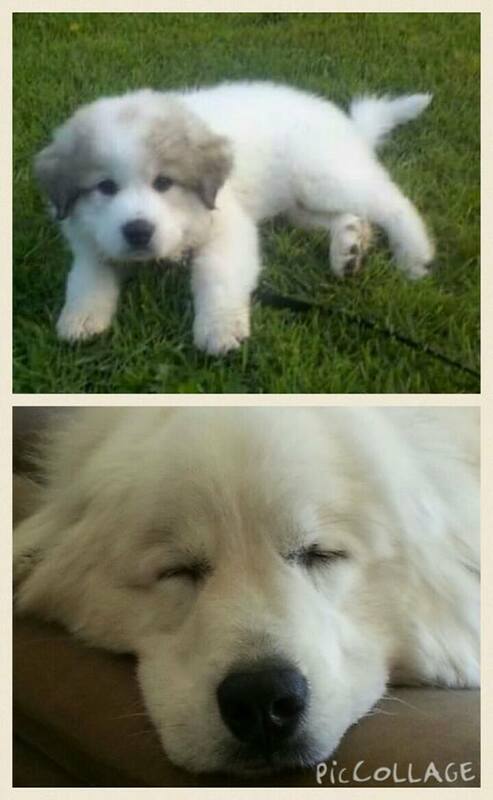 Check them out on Facebook at Beckman’s Great Pyrenees of Vaughn Hill! Image credit: Kayte Whitmer. These badger marks barely faded at all! 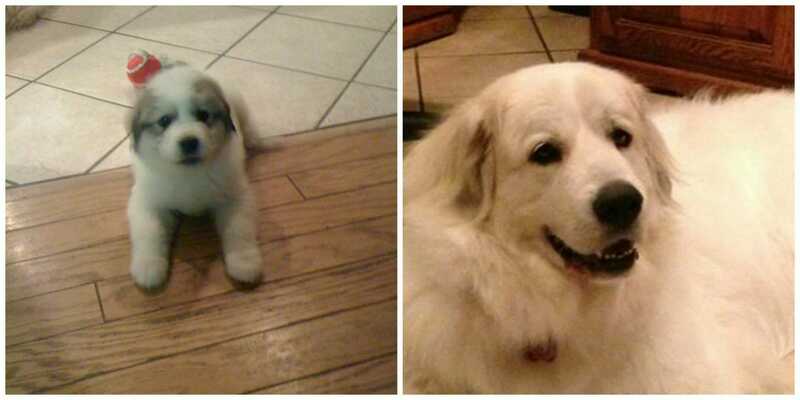 Debby Takacs Woodward’s Izabella at 8 weeks and 7 months. When badger marks fade, they typically fade quickly! 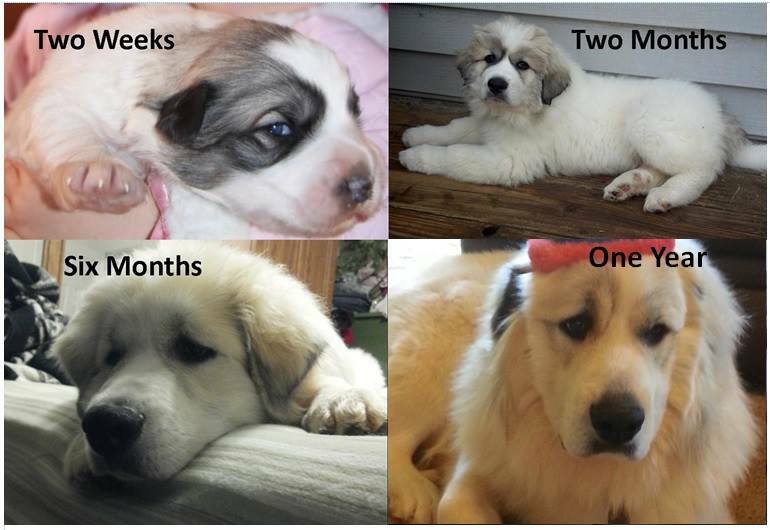 Shauna Turnbull’s pyrs at approximately 8 weeks, 6 months, and 4 years. They started dark, lightened, and then darkened again. Cassie Mason Hawkins-Hubbard’s Gabriela. 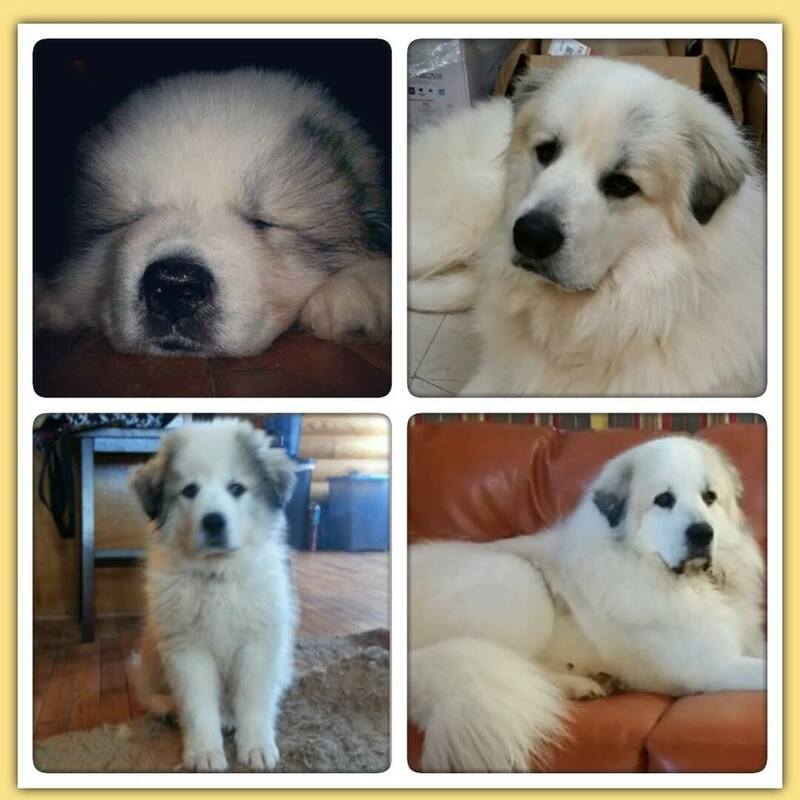 On Facebook at White Mountain Pyrenees of Halo Acres! Tami Fischer’s handsome boy. Mask went from dark, to light, back to dark! Tanja Paasonen’s Viljo – One of the coolest changes I’ve seen so far! 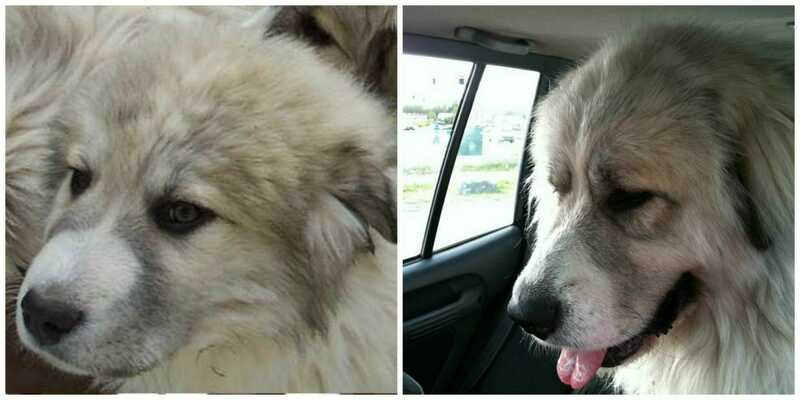 Do you have or have you seen a pyr with badger marks? 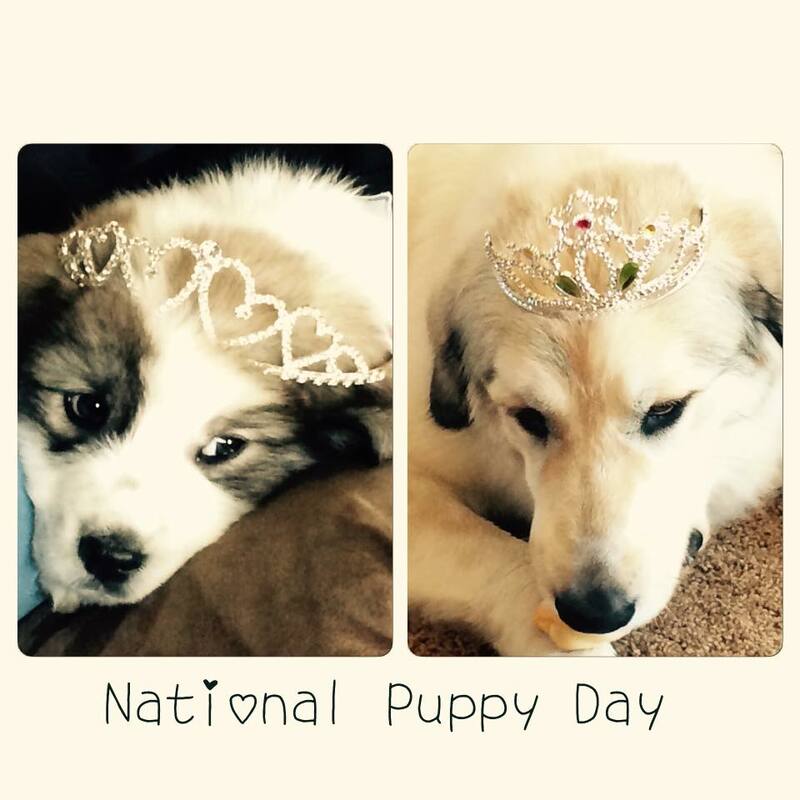 Wow, that’s a whole lotta Pyr beauty. I’m not surprised to think of puppies having markings that fade. But I’m surprised to hear about them reappearing in an adult dog. Any speculations on why that could be? 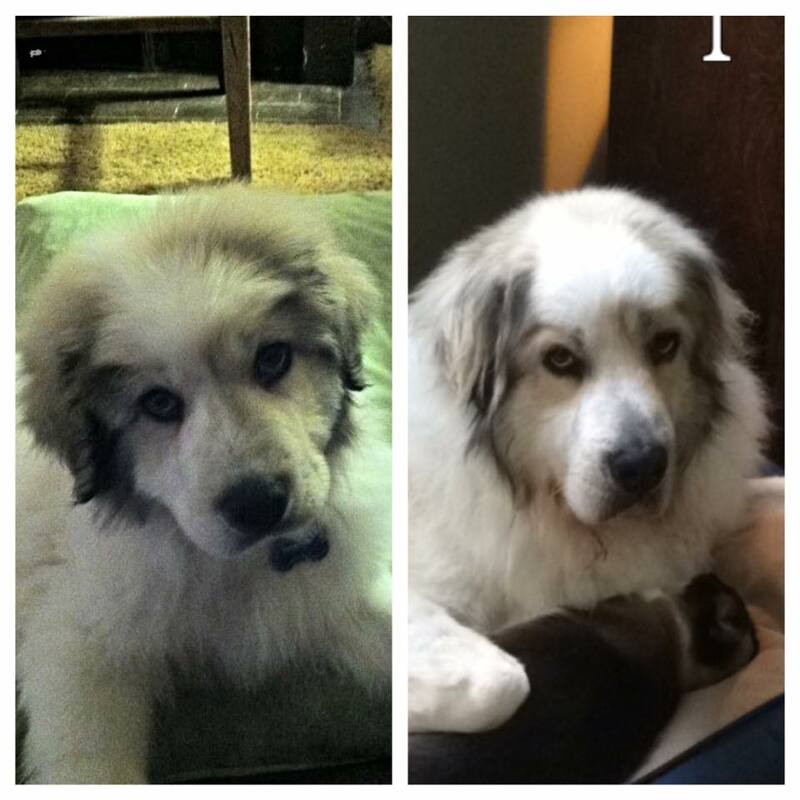 And do any other Pyr people you know have dogs who have regained their badger spots? Mauja’s badger marks are showing up again recently. She had light tan ears that faded to white by about 4 months of age. In the past few months I’ve noticed them reappearing. They’re much lighter than the ones she was born with, but darker than a year ago! I’ve met a couple people with marks to fade and then reappear in adulthood. I have absolutely no idea why! Definitely an interesting topic though. We adopted our 3-year-old Great Pyr gal on 1/1/17. She is pretty much pure white, a little bit of pale gray and tan on her ears. We’ve noticed lately that she is starting to show more very faint color: tan on her rump above her tail, more tan on her head between her ears, and even a big, very light tan spot on her side! She has been starting to blow her coat – wondering if that’s making the color show more. I have noticed this to be true, as well. In my experience the badger marks can fade or darken when coat is renewing. If both mom and dad are all white will the puppy’s have markings? My aunt and uncle have 3 pyrs. 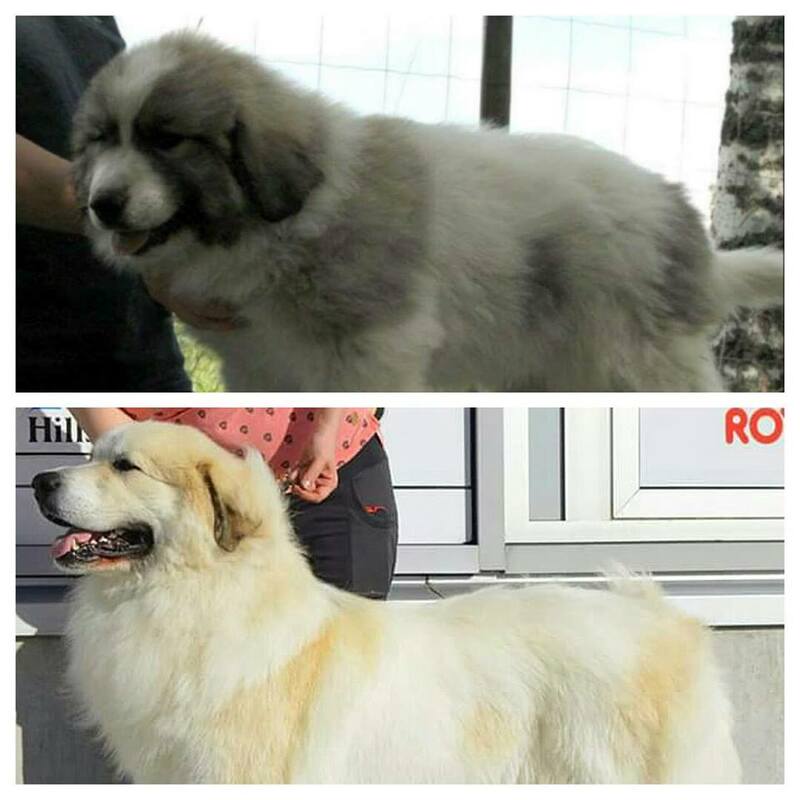 I don’t know this for fact but my speculation is that pyrs have two coats, so I wonder if the under coat is more like their skin and baby coat (this includes the badger markings). I wonder if it has to do with shedding and what coat is showing through. Perhaps that’s why it changes over time. Any other ideas? Officially the Blair markings are referred to as “Blaireau” in French meaning wolf or badger markings. I happen to be partial to the masks of Blairs and find them quite beautiful. You just saved me the time of typing the same explanation – thanks, Leslie! Really interesting, Kelsie! And so much cuteness, yes! I had no idea Great Pyrenees were anything but white and you can see from the first set of pics, that sometimes those puppy badger marks do get darker with age. Wow! I’ve never met a Pyr yet, but I did see a Leonberger recently. I’ve never seen such a tall dog. Dogo’s can have interesting markings and pigmentation as well. 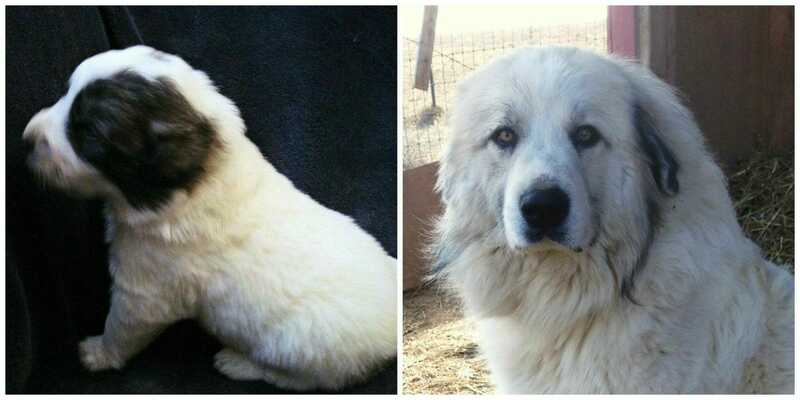 I love all of the Pyr pictures, such a gorgeous, loving breed. These pictures are ridiculously cute. 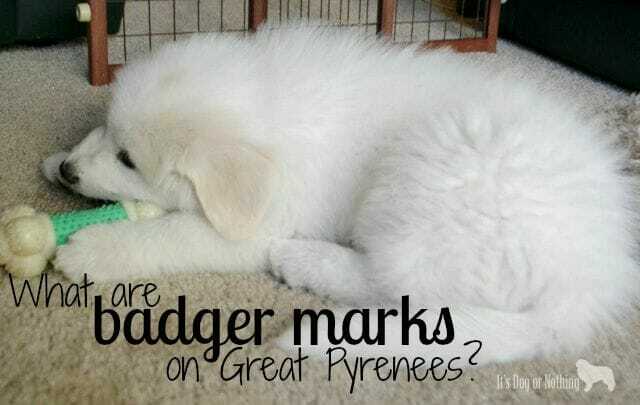 I didn’t know that Great Pyrenees can have these markings or that they are called badger marks! It reminds me of our kitten Lucas who was nearly all white when he came home with us and later developed various markings of tan and brown. I thought they were all white too. A little bit like Yorkies, they’re super dark as puppies and get lighter. Wow, that’s so interesting! I never knew Pyrs had coloration called Badger Marks. I would have been that person assuming the dog was a mix. I love to learn new things. Thanks for sharing! My Sheena stayed all white until she passed at 14. I love the Badger marked babies. Sorta reminds me of the Corgi breed. 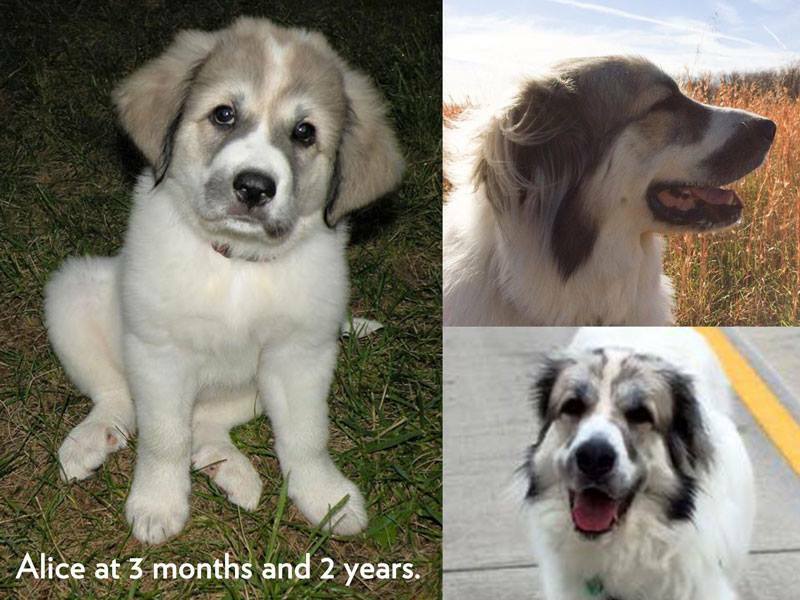 You can pick a puppy for color, but that doesn’t mean that they will still be the same color when they are 2 years old. My son picked a corgi that was basically black and tan. Pippa is basically white and tan with one small black spot now at 2 years. Great article! Cherokee had badger markings. At one year old they are much lighter now. I do hope he keep his dark grey ear tips. The tan near his eyes and at the base of his tail get lighter and lighter as time goes by. I had never heard that about badger marks before!!! Interesting! The badger marks on Snowy’s head are very faint and easy to miss unless you look closely. He also has a big brown spot on his back close to his tail. My markings covered most of my face when I was small, but they ended up looking like I’m wearing some eye shadow. Our Huey was born brown with black on his face and on most of his tail. He will be 1 in a few days and he’s more of a cream color with no black rather than the usual bright white. Just had our first (and most likely only) litter. 4 white/4 badger. Absolutely GORGEOUS markings. Love the pictures of the pups! So adorable, thanks for the post! I hear this all the time. My girl, Maggie May, is a badger marked gal with brown tipped ears and a brown patch over one eye. Most people will ask me if what she is, or if she is a Great Pyrenees mix. But she is pure GP. And beautiful. I try to briefly and kindly educate them that, no, she is full great pyr and it is called badger markings. Some of them just look at me with skepticism. But, oh well. My Bella has the badger markings and people are always asking what she is mixed with. She has a blond spot on her tail and freckles on her back. Her ears are smokey blond. And her nose has a blond bridge. 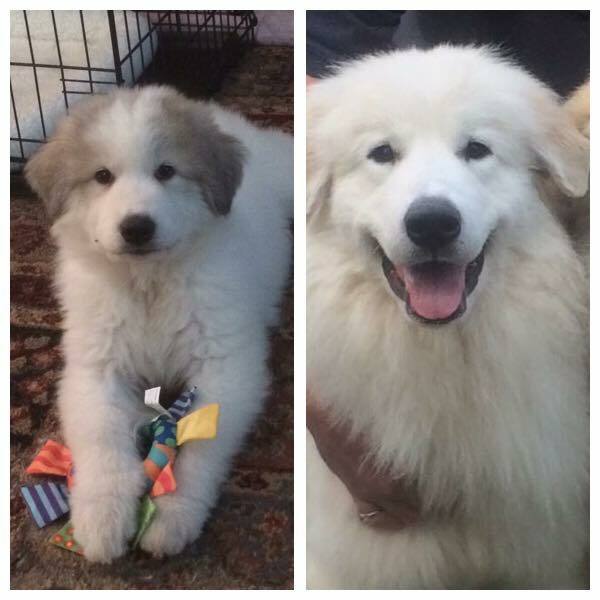 I adopted a 4mo old pup from a shelter that looks 100% Pyr except one thing; coat. He does have coloring on his head and tail which is normal. BUT his whole body appears to be a cream color and you can faintly see pure white socks. Can this be normal or does it suggest a mix? I just adopted a 4 month old with much the same markings. Both parents are pure white. The breeder assured me she will turn pure white but I have my doubts now after reading this article. While I hope she does, I love her just the same! So adorable, thanks for the share! Love this breed of dog! 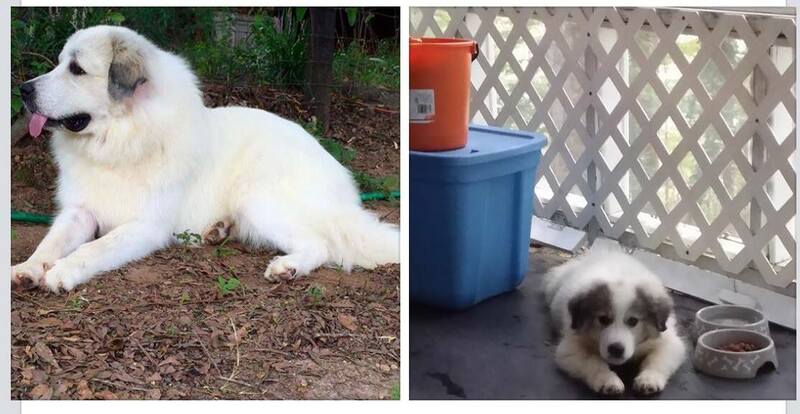 I just had a coworker tell me that the local vet said that if a pyr dog had any color on it that it was not a pure breed. I always thought Prys were pure white too. These photos are so adorable! I love these puppies with their cute little badger marks. Thanks for sharing. 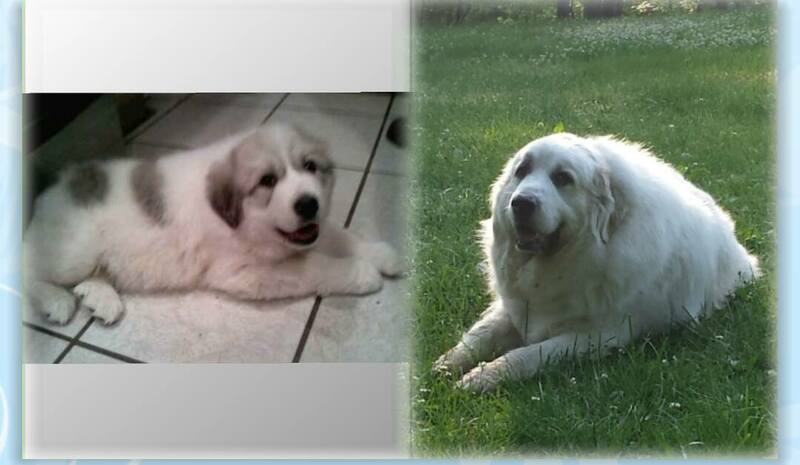 Our sweet girl had tan ears and a dark spot on her bum, but now – almost 9 years old – she is virtually all white. Her bum spot still peaks out a little in the right light, but my how she is changed! Oh my goodness! Such beautiful puppies! 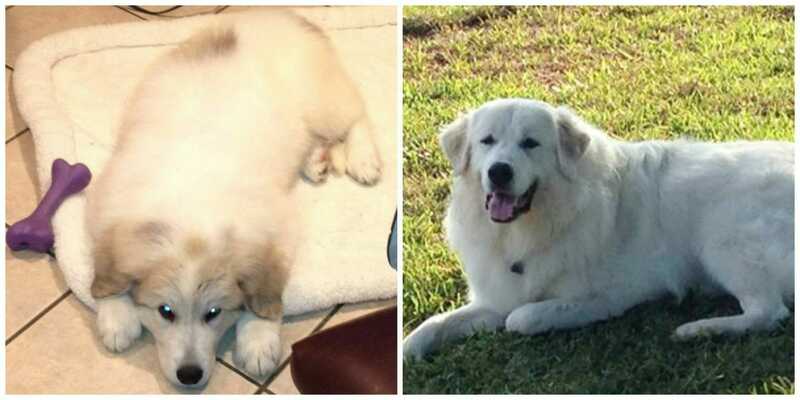 I’m so glad I have found these articles, as they have helped us understand our Pyr puppy, Mika, so much more. Everytime we take her anywhere, we’re always asked what she is mixed with. Everyone is always suprised to find out that she is full Pyranese! She has tan on top of her head, and her ears are gray, tan and black, with a good mix of those colors right at her back hips. She is currently only 7 months old, but she definitely has her own way of doing things, her own schedule, and is a GREAT protector on our little hilltop! Our boy is a 4-year-old rescue, and he has been in our family for a year, now (from Feb to Feb). We could swear he was all white to start, but now has striking (very obvious) tan spots on his sides (his “saddle bags”), at the base of his tail, his ears and head. His coat seems quite full at this point, so its not shedding that brought it out. I assumed that he is just so happy to have a happy home, that he is finally expressing his “true colors”! 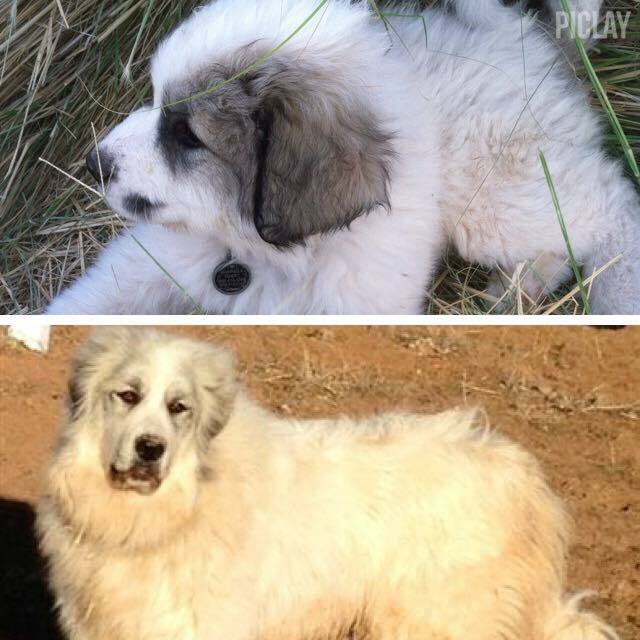 Can someone tell me where the name “badger” came from for the Pyr coloration? Our sweet Hattie has gray badger markings. People always ask if she’s mixed with anatolian, but she is all Great Pyr.